The Great White Egret is the bird, this page deals with (Casmerodius albus). Every year these birds appear at this NP territory for breeding purpose. All subsequent images were taken at the National Park Neusiedlersee Seewinkel, which is located in the south eastern corner of Austria. All Great White Egret photos taken in April 2005. The European breeding territories are occupied by the birds at about end of March. They remain here until all juveniles are fully fledged. 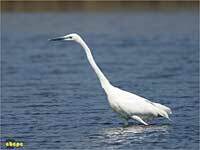 Great White Egrets are large birds, body length is about 90 cm and wing span about 190 cm. The birds prefer open water areas within reed environment. The nests are built on old reed. Great White Egrets sometimes form small breeding colonies, even together with other Egrets. All three to four light blue eggs are breeded by both genders. The cubs hatch after 25 days and after 6 weeks they start flying. 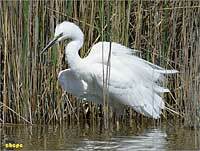 Great White Egrets are striders, their movements are supple and frequently they seem to be in slow motion. When hunting, they lie in wait for prey, sometimes for long times without any movement. When any prey is recognized, the sharp bill moves as quick as lightning to catch it. To get enlarged images, click on the preview thumbnails! Besides hunting in the water like shown here, Great White Egrets also are seen on ground areas, frequently as pairs. Fish and water insects are the prey at water territories, mouse, grasshoppers and even young birds on the ground. When landing, it sometimes seems that the bird has a lot of pleasure to make some strolling steps over the surface, before totally coming down. 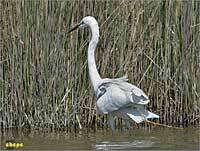 At breeding period, Great White Egrets wear some decorating feathers on their backs, they overtop their tails. The required hunting range is enabled by their long flexible necks, the sharp straight bill may be used even to pierce the caught prey. When flying close above water level, sometimes the wing tips may get a bit wet. Their legs they drag stretched back when flying. This one presents the transition from long-neck to s-neck flight. Black with yellow root is the color of the bill during mating period, the skin around the eyes is greenish-yellow and the iris shines sulphur-yellow. The bird's tail is rather a short one. On longer distance flights, Great White Egrets fly with impressive and majestic wing movements. In case of groups, they prefer forming slanting lines or V-formations. Sometimes a bird passes rather close, then a specific sound of rustling air can be heard.